A black and white negative of a portrait of Catharine Tunney. Catharine Tunney was born at Peterborough, Ontario, on 18 September 1955 and was raised in Oshawa. She move to Brooklin in 1982. Mrs. Tunney served six years in the 1980s as the Whitby representative on the Durham Catholic District School Board, three of which were as chairwoman. 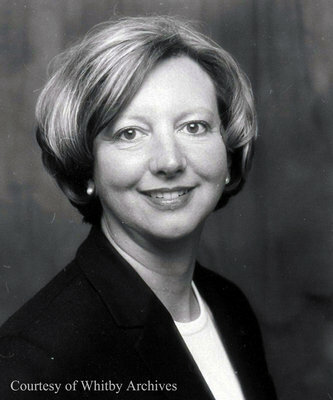 In 1992 she joined the Board of Governors of the Whitby General Hospital and was its last chairwoman from 1996 to 1998. She then joined the board of the Lakeridge Health Corporation. Mrs. Tunny served on the Durham District Health Council's acute care study and helped establish the Durham Community Foundation, the Sunrise Rotary Sorichetti Fund and the Amanda Heron Fund. In 1988 she received the Peter Perry Award as Whitby's Outstanding Citizen.